Winter has run its course and is now giving way to spring. Hopefully, your roof protected you last winter and kept you warm and cozy through the cold months. We could all relax at home during winter and do our favorite activities—read books, watch videos and have those relaxing evening conversations after dinner—if we trust our roof to keep the harsh elements out of our home. Now that spring is around the corner, it is time to show our appreciation to our roof by assessing how well it withstood the winter. Hopefully, it suffered no major problems that require immediate repair work. The best way to start checking your roof is by hiring the services of professional roofers to conduct an assessment for you. However, if you prefer to take the preliminary inspection, we outlined a guideline for roof maintenance that you can easily follow. Walk around the house at the ground and look at the gutters. Do they look somewhat out of place or sagging in some areas? Look for signs of water stains as these indicate overflowing, which in turn means that the gutter might be clogged. If so, check for debris and accumulation of dirt, leaves and other materials. Check the flashings too as they might have moved out of place. Regularly cleaning the gutter is always a good idea since dirt tends to accumulate through time and hinder the flow of water. 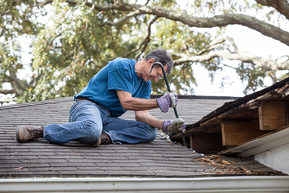 Make sure the gutter is securely fastened to the eaves. Replace damaged areas if you noticed any holes or cracks to keep your gutter in tiptop condition. Note the condition of the roof. Are there are any sagging rooflines? Check for any loose or missing shingles that could have blown off the roof during winter. Debris on the roof is a starting area for water ponding and pooling of snow and ice. A visual inspection easily reveals the presence of moss and algae that are not only unsightly but could degrade your roof. A zinc strip can be installed and is effective against these infestations. Go up on the roof on a sunny day or when the weather is good. Observe all safety precautions in using ladders before going up. You can inspect the roof more closely up there and perform necessary repairs such as replacing missing or damaged shingles. Being up on the roof is the best time to check your chimneys and pipes. Pay close attention to the flashings and see if they are still securely fastened. Check the mortar on your chimney for any crumbling sign. A professional should do the work if you noticed problems on your chimney. While essential repairs may be done by homeowners with basic skills and knowledge on roofing, we recommend leaving major repairs to the professionals for your safety and quality of work.